Our product range includes a wide range of belt conveyor, ms belt conveyor, ss belt conveyor, pressing belt conveyor, flat belt conveyor and bottom printing belt conveyor. Our organization is placed among the noteworthy enterprise engaged in offering an excellent assortment of Belt Conveyor. Our professionals bring forth an excellent range of conveyor that is manufactured using premium quality material and latest techniques at our production unit. In addition, this conveyor is built and developed adhering to industry standards. Furthermore, our professionals opt for strict quality inspection made on the conveyor to ensure flawless performance. Assisted by a qualified workforce and advanced manufacturing unit, we are engaged in offering a wide range of MS Belt Conveyor. This belt conveyor is used in different kind of industries such as CNC machine shops, paper mills, rice mills, food processing units, and cement factories. In order to ensure that the offered belt conveyor delivers optimum performance, our professionals manufacture the machine using top graded stainless steel, and components under the observation of experts. The modular design allows adding complete conveyors or extensions to existing production line. Used in a variety of material handing applications, including food and beverage processing, manufacturing, mining, packaging, and power transmission. Some conveyor belts are designed to transport commercial goods, construction materials, forest products, or pulp and paper. Since our foundation, we are engaged in presenting an outstanding quality array of SS Belt Conveyor. This belt conveyor is manufactured using aluminum alloy and stainless steel materials. The offered belt conveyor is used in various distilleries, breweries plants, food processing industry, and many other belt conveyor manufacturing companies. Provided belt conveyor is designed and manufactured after surveying plants, companies and industry. Therefore, it offers optimum performance and flawless service to the clients. 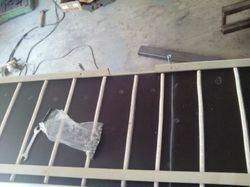 Also, clients can avail the belt conveyor at cost effective rates. We are successfully ranked amongst the topnotch entity offering a wide range of Pressing Belt Conveyor. This horizontal designed conveying belt is used in companies processing cereal, food grains, packaged drinking water, liquid, water, and milk. The offered belt is manufactured using quality aluminum, steel and approved components. As a result, the clients find the conveyor belt offering optimum performance and long service life. Apart from this, clients can avail the machine within stipulated period of time. We are offering superior quality Belt Conveyor that is available in a wide variety of lengths, widths, and construction materials and types. Both straight and curved configurations (L, S, and U-shapes) are available too; this conveyor is used for carrying material from one place to another. The offered conveyor is precisely engineered using excellent quality components and cutting-edge technology. We provide this conveyor in various specifications at industry leading price. We are offering superior quality MS Bottom Printing Conveyor that is available in a wide variety of lengths, widths, and construction materials and types. Both straight and curved configurations (L, S, and U-shapes) are available too; this conveyor is used for carrying material from one place to another. The offered conveyor is precisely engineered using excellent quality components and cutting-edge technology. We provide this conveyor in various specifications at industry leading price. We are offering superior quality MS Grip Conveyor that is available in a wide variety of lengths, widths, and construction materials and types. Both straight and curved configurations (L, S, and U-shapes) are available too; this conveyor is used for carrying material from one place to another. The offered conveyor is precisely engineered using excellent quality components and cutting-edge technology. We provide this conveyor in various specifications at industry leading price. 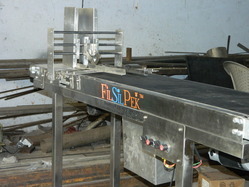 Filsilpek Solutions variable Belt Conveyor for Food Packing are built to fit your production needs. They are available in a wide variety of lengths, widths, and construction materials and types. Both straight and curved configurations (L, S, and U-shapes) are available to help you maximize your production proficiency and fit your space requirements. The modular design allows you to add complete conveyors or extensions to your existing production line. Whatever your packaging environment may be, Filsilpek Solutions will manufacture the right conveyor to suit your needs. They are used in a variety of material handing applications, including food and beverage processing, manufacturing, mining, packaging, and power transmission. Some conveyor belts are designed to transport commercial goods, construction materials, forest products, or pulp and paper. 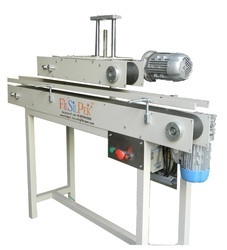 We are offering superior quality MS Bottle Printing Conveyor that is available in a wide variety of lengths, widths, and construction materials and types. Both straight and curved configurations (L, S, and U-shapes) are available too; this conveyor is used for carrying material from one place to another. The offered conveyor is precisely engineered using excellent quality components and cutting-edge technology. 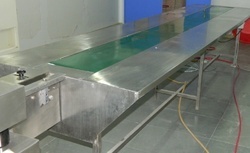 We provide this conveyor in various specifications at industry leading price. Filsilpek Solutions variable speed conveyors are built to fit your production needs. They are available in a wide variety of lengths, widths, and construction materials and types. Both straight and curved configurations (L, S, and U-shapes) are available to help you maximize your production proficiency and fit your space requirements. The modular design allows you to add complete conveyors or extensions to your existing production line. Whatever your packaging environment may be, Filsilpek Solutions will manufacture the right conveyor to suit your needs. Assisted by a qualified workforce and advanced manufacturing unit, we are engaged in offering a wide range of Horizontal Beg Printing Conveyor. This conveyor finds large application use in hard industry sector. High performance and accurate production is the most impressive feature of the conveyor. In order to provide excellent production from the conveyor, our professionals after manufacturing the conveyor opts for strict quality checks. The offered quality checks include accuracy, circular degree, pistol alignment, power distribution and rotating speed. We are offering superior quality MS Belt Conveyor that is available in a wide variety of lengths, widths, and construction materials and types. Both straight and curved configurations (L, S, and U-shapes) are available too; this conveyor is used for carrying material from one place to another. The offered conveyor is precisely engineered using excellent quality components and cutting-edge technology. 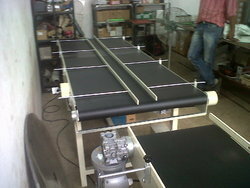 We provide this conveyor in various specifications at industry leading price. Filsilpek Solutions variable Packing Belt Conveyor are built to fit your production needs. They are available in a wide variety of lengths, widths, and construction materials and types. Both straight and curved configurations (L, S, and U-shapes) are available to help you maximize your production proficiency and fit your space requirements. The modular design allows you to add complete conveyors or extensions to your existing production line. Whatever your packaging environment may be, Filsilpek Solutions will manufacture the right conveyor to suit your needs. We are offering superior quality MS Conveyor that is available in a wide variety of lengths, widths, and construction materials and types. Both straight and curved configurations (L, S, and U-shapes) are available too; this conveyor is used for carrying material from one place to another. The offered conveyor is precisely engineered using excellent quality components and cutting-edge technology. 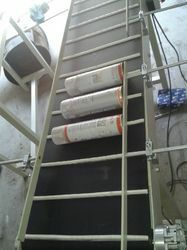 We provide this conveyor in various specifications at industry leading price. Our clients can avail an excellent quality range of SS Belt Conveyor that is used in various industries. This conveyor is available in a wide variety of lengths, widths, and construction materials and types. Designed and developed by our experts using superior quality components with the help of cutting-edge technology, this conveyor is manufactured with advanced engineering concept as per the set industry standards. 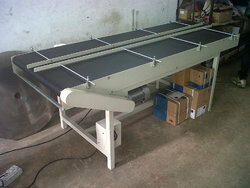 This conveyor is offered at highly reasonable price to the clients. With the assistance of our team of professionals, we are engaged in providing an assorted range of Slat Conveyors. These conveyors are available in a wide variety of lengths, widths, and construction materials & types and also in both straight and curved configurations (L, S, and U-shapes). Its modular design allows adding complete conveyors or extensions to existing production line. 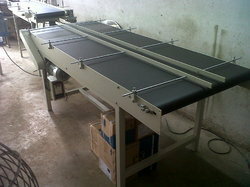 Our clients can avail these conveyors from us at highly affordable price. Used in machine to transfer flat things like soar, etc.